A real TREASURE!! You could spend a lifetime looking for one of these, in this un-used condition, as though it was sitting on Woolworth's shelf for the past 40 years!!! 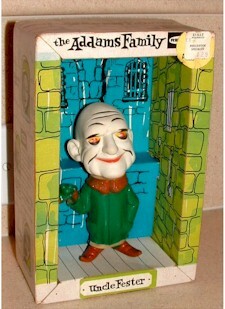 "Rare" original "Lurch" figure from the Television Series, The Addams Family. It is in Very Good Condition and measures 5 1/2" tall. Lurch has a rubber head and the body is vinyl. Marked on back, (see picture), "LURCH, The Addams Family, 1964 Filmways TV Prod. Inc Excellent condition, to go with the Filmways "Fester" above. 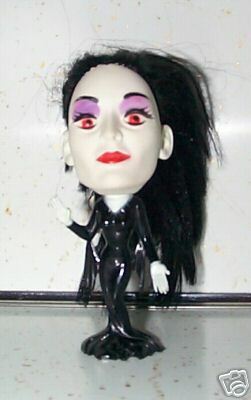 "Rare" original "Morticia" figure from the Television Series, The Addams Family. It is in Very Good Condition and measures 4 1/2" tall. Morticia has a rubber head and the body is vinyl. Marked on back, (see picture), "The Addams Family, 1964 Filmways TV Prod. Inc Excellent condition, to go with the Filmways "Fester" and "Lurch"above.